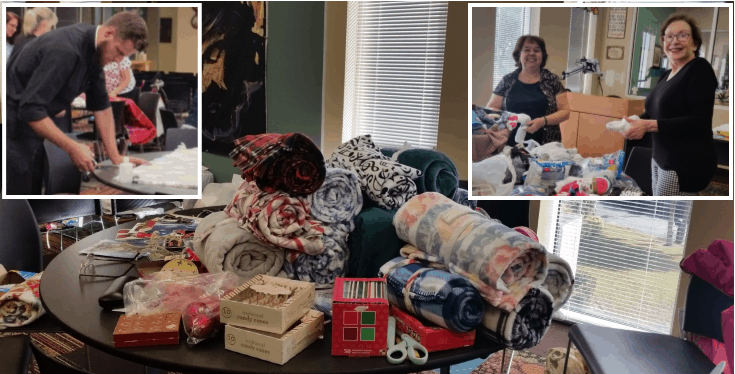 “A Stitch in Time,” Create to Donate is an adult ministry that creates many baby items, walker bags for the handicapped and blankets for the homeless and abused. Some of the items we create are: baby blankets, bibs, burp cloths, baby caps, senior lap blankets, quilts, walker and wheelchair accessory bags for the impaired. The following organizations have received some of our items: JMJ Life Center, Brookdale Memory and Assisted Living Residence, Women's Emmaus, Harbor House and some of our Holy Family parishioners. A Stitch in Time is open to any adult that has a love for creating handmade items and a willingness to help others. All levels of expertise in sewing, knitting and crocheting are welcome. If your talents don’t fall in the areas mentioned, we always need folks to cut, iron, or donate fabric and yarn. We meet once a month on the first Monday from 1 p.m. to 5 p.m. year round with a recess in the months of July and August.